Also serving communities of Parkersburg. The average cost of assisted living in Grundy Center is $3,600 per month. This is higher than the national median of $3,346. Cheaper nearby regions include Conrad with an average starting cost of $2,195. To help you with your search, browse the 5 reviews below for assisted living facilities in Grundy Center. On average, consumers rate assisted living in Grundy Center 4.8 out of 5 stars. Better rated regions include Marshalltown with an average rating of 5.0 out of 5 stars. Caring.com has helped thousands of families find high-quality senior care. To speak with one of our Family Advisors about assisted living options and costs in Grundy Center, call (855) 863-8283. Grundy Center, which was founded in 1877, is situated just 30 minutes away from the Cedar Falls/Waterloo area. The city is named for Felix Grundy, a 19th-century criminal lawyer who is considered to be among the greatest of his time. Today, the county in which Grundy Center is situated has about 12,000 people, approximately 21 percent of which are over the age of 65. The small community of Grundy Center has just one assisted living community. Seniors who are looking for alternative options will find an additional seven in the surrounding area. In the Grundy Center region, as in all of Iowa, assisted living facilities are officially called assisted living programs or residential care facilities, depending on the level of care they provide. Both types of facilities are licensed through the Department of Inspections and Appeals, Health Facilities Division. Grundy Center's overall cost of living is about 14 percent lower than the U.S. average, which may help seniors put more money in their assisted living budget. Transportation costs are 26 percent lower than the national average, but seniors can expect to spend about 16 percent more on health care here than they would elsewhere in the country. Grundy Center has a low crime rate, which may appeal to seniors who enjoy being out alone in the community. On a scale of 1 to 100, with 1 representing low crime, this community is rated a 23.8 for both violent crimes and property crimes. Summers in Grundy Center are warm and humid, with highs in the low-80s, and winters are dry, windy and freezing, with January lows in the single digits. This may be a consideration for seniors who enjoy being active outdoors. Grundy Center seniors do not pay income tax on Social Security benefits, and the state offers a deduction for other types of retirement income. This may allow seniors to put more money toward the cost of their care. The Grundy Center area is home to world-class medical facilities, including Grundy County Memorial Hospital, in the event of medical emergencies or illness. Grundy Center is home to several arts and cultural amenities, including a community-owned movie theatre, which shows classics and newer movies. Seniors over the age of 60 get to enjoy shows at a discounted rate. Assisted Living costs in Grundy Center start around $3,600 per month on average, while the nationwide average cost of assisted living is $4,000 per month, according to the latest figures from Genworth’s Cost of Care Survey. It’s important to note that assisted living rates in Grundy Center and the surrounding suburbs can vary widely based on factors such as location, the level of care needed, apartment size and the types of amenities offered at each community. Grundy Center seniors may have their assisted living services covered through a Medicaid 1915(c) Elderly Waiver program, which is administered by the Department of Human Services. Grundy Center and the surrounding area are home to numerous government agencies and non-profit organizations offering help for seniors searching for or currently residing in an assisted living community. These organizations can also provide assistance in a number of other eldercare services such as geriatric care management, elder law advice, estate planning, finding home care and health and wellness programs. To see a list of free assisted living resources in Grundy Center, please visit our Assisted Living in Iowa page. Grundy Center-area assisted living communities must adhere to the comprehensive set of state laws and regulations that all assisted living communities in Iowa are required to follow. 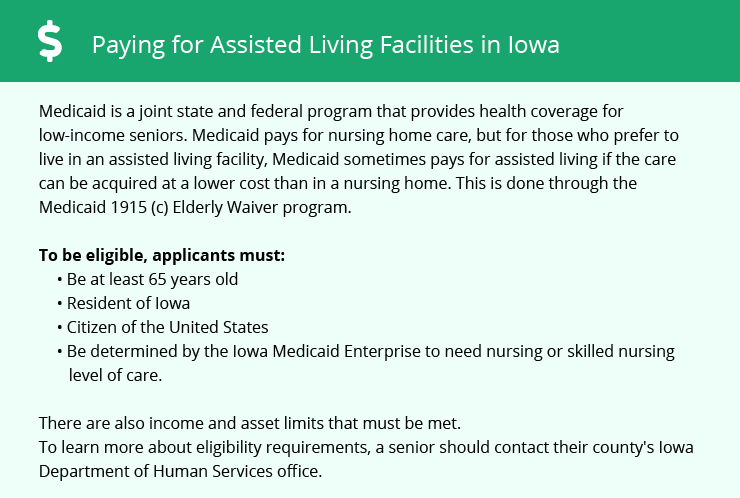 Visit our Assisted Living in Iowa page for more information about these laws.